I will send you via a PM (personal message) the newest chat link we are useing. I am online during the day and can chat when you need someone to talk to. feel free to pm me or email me if you want someone to chat with.Welcome to a wonderful drama free board. I saw a new rheumatologist today, since I moved earlier this year and it's no longer convenient for me to see the one I went to before. The examination he gave me was a very thorough one and he is certain that I have fibromyalgia, even before the results of the blood test are in. He also thought that there was nothing elso going on with me, no arthritis or anything. I asked him whether the other symptoms I have had in the last two years, such as low platelet count, low red blood cell count, elevated sed rate and positive ANA/anti SSA/anti SSB was also a feature of fibromyalgia and he said no. However, he also said and I quote "that sometimes the results of blood tests don't fit the overall picture and then we just put them aside." Doesn't that sound a bit irresponsible? I'm glad that I'm finally diagnosed with something, even if it is fibromyalgia, but just "putting aside" symptoms and blood test results that don't "fit", is that really good medicine? Anyway, I'm supposed to start taking amitriptyline (Elavil) at night, to help me sleep. It's an antidepressant and I'm definitely NOT depressed, but he says it will help my muscles relax or whatever. He doesn't want me to take Neurontin any more, but he didn't tell me to stop taking Plaquenil, which I've been taking for over a year, so I'll continue taking that. Has anyone tried Elavil? Does it work? Does it make you gain weight? I have not been on Elavil before so I don't know how it works . I hope & pray it helps with the pain for you. I guess I should cay Congrats on the dx of Fibro, you now know it wasn't all in your head.My Drs. attitude is alot like yours and pushed aside the lab levels and just wants to concentrate & treat my symptoms not the name. Here is side effect info for you. It states "weight gain or weight loss". So if you need to lose weight that would be good I guess. Be sure to report any bad side effects immediantly! Within each category the following adverse reactions are listed in order of decreasing severity. Included in the listing are a few adverse reactions which have not been reported with this specific drug. However, pharmacological similarities among the tricyclic antidepressant drugs require that each of the reactions be considered when amitriptyline is administered. CNS and Neuromuscular: Coma; seizures; hallucinations; delusions; confusional states; disorientation; incoordination; ataxia; tremors; peripheral neuropathy; numbness, tingling, and paresthesias of the extremities; extrapyramidal symptoms including abnormal involuntary movements and tardive dyskinesia; dysarthria; disturbed concentration; excitement; anxiety; insomnia; restlessness; nightmares; drowsiness; dizziness; weakness; fatigue; headache; syndrome of inappropriate ADH (antidiuretic hormone) secretion; tinnitus; alteration in EEG patterns. Anticholinergic: Paralytic ileus; hyperpyrexia; urinary retention; dilatation of the urinary tract; constipation; blurred vision, disturbance of accommodation, increased ocular pressure, mydriasis; dry mouth. Withdrawal Symptoms: After prolonged administration, abrupt cessation of treatment may produce nausea, headache, and malaise. Gradual dosage reduction has been reported to produce, within two weeks, transient symptoms including irritability, restlessness, and dream and sleep disturbance. These symptoms are not indicative of addiction. Rare instances have been reported of mania or hypomania occurring within 2-7 days following cessation of chronic therapy with tricyclic antidepressants. Body as a Whole: Lupus-like syndrome (migratory arthritis, positive ANA and rheumatoid factor). Drugs Metabolized by P450 2D6 ¾ The biochemical activity of the drug metabolizing isozyme cytochrome P450 2D6 (debrisoquin hydroxylase) is reduced in a subset of the caucasian population (about 7-10% of caucasians are so called "poor metabolizers"); reliable estimates of the prevalence of reduced P450 2D6 isozyme activity among Asian, African and other populations are not yet available. Poor metabolizers have higher than expected plasma concentrations of tricyclic antidepressants (TCAs) when given usual doses. Depending on the fraction of drug metabolized by P450 2D6, the increase in plasma concentration may be small, or quite large (8-fold increase in plasma AUC of the TCA). In addition, certain drugs inhibit the activity of this isozyme and make normal metabolizers resemble poor metabolizers. An individual who is stable on a given dose of TCA may become abruptly toxic when given one of these inhibiting drugs as concomitant therapy. The drugs that inhibit cytochrome P450 2D6 include some that are not metabolized by the enzyme (quinidine; cimetidine) and many that are substrates for P450 2D6 (many other antidepressants, phenothiazines, and the Type 1C antiarrhythmics propafenone and flecainide). While all the selective serotonin reuptake inhibitors (SSRIs), e.g., fluoxetine, sertraline, and paroxetine, inhibit P450 2D6, they may vary in the extent of inhibition. The extent to which SSRI-TCA interactions may pose clinical problems will depend on the degree of inhibition and the pharmacokinetics of the SSRI involved. Nevertheless, caution is indicated in the coadministration of TCAs with any of the SSRIs and also in switching from one class to the other. Of particular importance, sufficient time must elapse before initiating TCA treatment in a patient being withdrawn from fluoxetine, given the long half-life of the parent and active metabolite (at least 5 weeks may be necessary). When amitriptyline HCl is given with anticholinergic agents or sympathomimetic drugs, including epinephrine combined with local anesthetics, close supervision and careful adjustment of dosages are required. Hyperpyrexia has been reported when amitriptyline HCl is administered with anticholinergic agents or with neuroleptic drugs, particularly during hot weather. Paralytic ileus may occur in patients taking tricyclic antidepressants in combination with anticholinergic-type drugs. Cimetidine is reported to reduce hepatic metabolism of certain tricyclic antidepressants, thereby delaying elimination and increasing steady-state concentrations of these drugs. Clinically significant effects have been reported with the tricyclic antidepressants when used concomitantly with cimetidine. Increases in plasma levels of tricyclic antidepressants, and in the frequency and severity of side effects, particularly anticholinergic, have been reported when cimetidine was added to the drug regimen. Discontinuation of cimetidine in well-controlled patients receiving tricyclic antidepressants and cimetidine may decrease the plasma levels and efficacy of the antidepressants. I feel sort of weird about ignoring blood test results, but I suppose if I get better it doesn't matter what my condition is called. I'm 100% sure that I have fibromyalgia and I feel like my previous rheumatologist ignored it, however this rheumatologist wants to ignore everything BUT the fibro... Wonder which is better. Anyway, I looked up some patient histories on the internet and almost all of them reported a weight GAIN on Elavil and nobody mentioned weight loss. Which is kind of scary, since I gained weight on Neurontin and I hate, hate, hate being overweight and I don't want to gain any more. In fact, I'm desperate to lose weight and I'm starting a new diet as well as working out with a personal trainer. THis isn't a stupid question, but you could call first thing tommorow and let the Dr. be aware that there is a weight issue here and you would like to try a medication that doesn't have it as a side effect. Ask what all other alternative meds are available for you. Keep us posted I'm sure others who have been on this Elavil will post soon. Tommorow (Tuesday ) we are having chat and I'd love to have you join us. Perhaps you can get some imput or advice from others. Thanks for the invite. I'll try, if I can figure out the chat program. I tried to log into the chat, but my computer wouldn't cooperate. Don't know why. 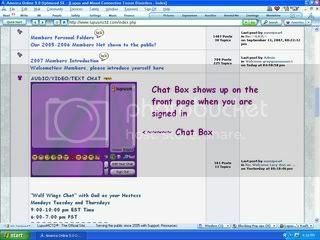 Here is Gail's Wolf Wing's Chat Room. I tried the chat link again today. Every time I click on the topic "out chat room link" my browser shuts down. Does the chat not work for Macs? I tried the chat link again today. Every time I click on the topic "our chat room link" my browser shuts down. When you sign into our website this is where the chat box is located on the front page. Honey, how are you feeling? I just came across this today. We have several new Fibro members. When you have time could you update us on how you are feeling. First and foremost, I'm keeping you in my prayers! About the chat box...do you have any firewalls or surf controls that may keep it from showing up? The chat box on The Coffee Shop will not show up on some computers that have these. I'll try to find a solution if I can. It's been a few months, how are you doing? Have your meds changed?